Just like last year, while the rest of the state gears up for an important Indianapolis Colts football game, Wabash fans will pack Chadwick Court for the biggest game on the North Coast Athletic Conference men’s basketball schedule to this point in the season. Saturday at 2 p.m. the seventh-ranked Little Giants will play number-one ranked Wooster before the Colts play the New York Jets in the opening round of the NFL playoffs. Last season the two teams met on Sunday afternoon prior to the Colts’ 31-17 loss to New Orleans in Super Bowl XLIV. Wooster came away with a 64-61 win at Wabash that day, outscoring the Little Giants 5-2 in the final 40 seconds of the game. Both Wabash and Wooster enter the game with identical 13-0 records. The Little Giants hold a half-game lead in the conference standings with a 5-0 record, while Wooster and Wittenberg are tied with 4-0 marks. 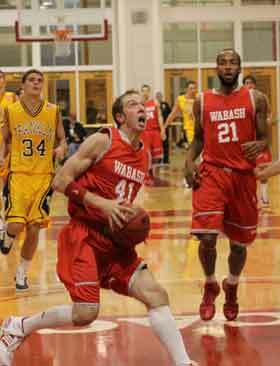 The 13 wins to open the season are the most by a Wabash basketball team since the 1907-08 team went 24-0. The Little Giants opened the 1999-2000 NCAC season with six straight victories, the only time since Wabash joined the league in 1999 the team has started 6-0 in conference play. Wabash head coach Mac Petty is not worried about the rankings or the records. He and his team are ready for a challenge against a very good opponent Saturday — nothing more. The Little Giants have already gained some experience in terms of keeping their focus and not getting wrapped up in the national rankings. Wabash handed Randolph-Macon College a 15-point loss earlier this year at Chadwick Court when the YellowJackets were ranked second in the nation in the D3hoops.com poll. However, Petty believes that victories over Wooster in the past few seasons are even more important than the win over Randolph-Macon earlier this year. Despite a 28-4 edge in the all-time series in favor of the Scots, Wabash is 2-4 versus Wooster in the last six meetings. The two teams have split the last two games at Chadwick Court. Wooster lost 75-58 to the Little Giants in 2009 before taking the three-point victory in last year’s game in Crawfordsville. Petty believes that win two seasons ago provides an important key to his team heading into this year’s contest. The Little Giants’ defense has helped keep the team’s undefeated streak in tact through the first 13 games of the season. Wabash has only allowed two teams to score 60 or more points this year and rank fifth in the nation in scoring defense (54.5 points per game). The Little Giants are third in the nation in field goal defense, holding opposing teams to 36.1 percent shooting on the season. 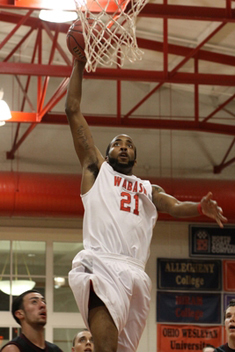 Wabash is led by All-Great Lakes Region and two-time First Team All-NCAC guard Wes Smith. The Lawrence North High School product tops the NCAC scoring list and is 13th in the nation with a 23.1 points-per-game average. He is sixth in the league in shooting percentage, hitting 52.5 percent of his shots from the field this season. Junior guard Aaron Zinnerman is averaging 8 points a game, while senior starter Ben Burkett is scoring 7.2 points a contest. Junior transfer AJ Sutherlin (6.7 ppg) and junior Derek Bailey (6.2) have been key contributors coming off the bench. The Little Giants have used a rotation of ten players throughout the year to provide balanced scoring on the floor. Senior Ian Franks, a 2010 All-American and NCAC Men’s Basketball Player of the Year, paces the Wooster offensive attack by averaging 18.5 points a game. The second-leading scorer in the NCAC, Franks also averages 6.6 rebounds and 3.6 assists per contest. Junior Justin Hallowell and senior Nathan Balch are also scoring in double figures. Hallowell is scoring 13.5 points a contest, while Balch adds 12.6 points a game. Starters Matt Fegan and Bryan Wickliffe are each scoring more than eight points a game. The Scots average 79.5 points a contest and are holding their opponents to 62.5 points a game. Petty believes four simple principles will help decide the outcome of Saturday’s contest against Wooster. Admission to Saturday’s game is free of charge. A live video feed is also available free of charge here, or if you live in the Montgomery County area you can listen to the game on WNDY (91.3 FM). Photos - (top right) Wes Smith's 23 points a game have helped the Little Giants to their best start since the 1907-08 Wabash team went 24-0. (Middle left) Junior Derek Bailey has been a key reserve for Wabash this season. His two free throws and Franklin and a buzzer-beater 3-point shot at Kenyon have preserved the Little Giants' winning record. (Bottom right) Indianapolis Colts offensive line coach Pete Metzelaars played football and basketball at Wabash. 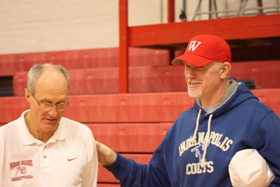 He stopped by Chadwick Court Friday afternoon after the Colts' walk-through to watch his former basketball coach, Mac Petty, put the Little Giants through their final practice before Saturday's game against Wooster.